Team Szabados forward Audra Richards (21) is congratulated after scoring a goal against Team Stecklein in the NWHL All-Star Game in Nashville. 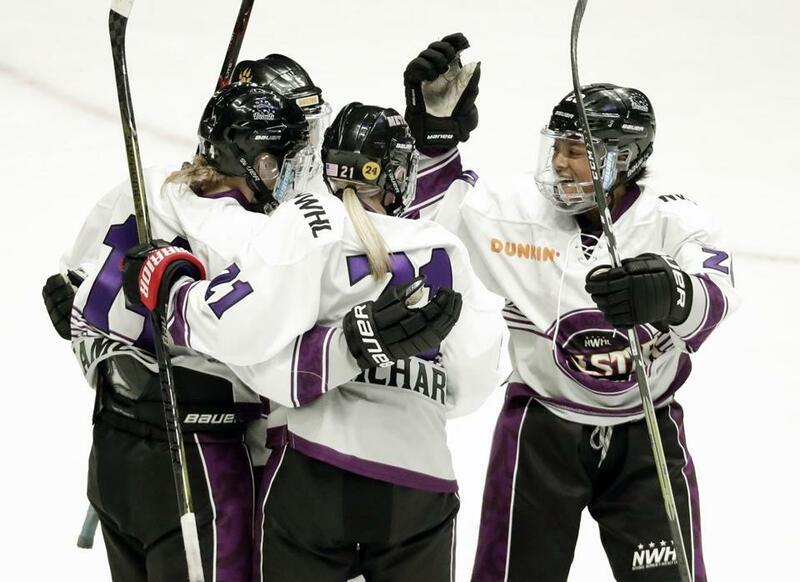 The NWHL All-Star Game at Bridgestone Arena in Nashville was attended by 6,120 fans — a record crowd for a professional women’s hockey game in the United States. The game featured 11 women who competed in the 2018 Winter Olympics and was played in the NHL rink following the Predators’ 5-4 overtime loss to the Blues, with fans allowed to stick around afterward. In the contest, goalie Katie Burt stopped Gigi Marvin in the shootout for a 3-2 win for Team (Shannon) Szabados over Team (Lee) Stecklein. Still, there is a vision of one combined pro league, as opposed to the current reality of splitting the best women in the world between two competing North American leagues: The US-based National Women’s Hockey League and the Canadian Women’s Hockey League. The US team will play Canada’s best starting Tuesday in a three-game ‘‘Rivalry Series’’ starting in London, Ontario, and ending in a week in Detroit. ‘‘We have so much talent, I think it’d be really fun if we got to play each other all the time,’’ Stecklein said. Dani Rylan founded the NWHL in 2015 after splitting off from the CWHL, which is in its 12th season, and has six teams with four in Canada, one in the United States and another in China. Team Stecklein forward Allie Thunstrom shoots against Team Szabados goalie Shannon Szabados in the NWHL All-Star Game in Nashville. The Anaheim Ducks, in the midst of a seven-game losing streak and a free fall into last place in the Western Conference, fired coach Randy Carlyle. The Ducks are the sixth team to make a change this season, joining Los Angeles, Chicago, St. Louis, Edmonton, and Philadelphia. They have made the playoffs six straight seasons but have won just two of their last 21 games. Carlyle, the winningest coach in Ducks history, led the team to the Stanley Cup in 2007 and three appearances in the Western Conference final. General manager Bob Murray saidhe would act as interim coach for the remainder of the season. Duke University is investigating a sexual assault allegation made Friday against a former men’s basketball player. The player’s identity wasn’t released. The accusation was made in a statement by the lawyers of Meredith Watson, who is also alleging that Virginia Lieutenant Governor Justin Fairfax sexually assaulted her on the Durham, N.C., campus when they were students in 2000. Fairfax has denied the allegation. “Ms. Watson was raped by a basketball player during her sophomore year at Duke,” the statement said. "She went to the dean, who provided no help and discouraged her from pursuing the claim further. Ms. Watson also told friends, including Justin Fairfax.” The university said in a statement it was looking into the matter. The Indiana State Department of Health said that people who had contact with a bat during the Pacers-Clippers NBA game Thursday possibly have been exposed to rabies. The department said that anyone who may have touched the bat with bare skin is urged to call the agency or contact a health care provider about receiving rabies vaccinations. It said that since the bat is no longer in Bankers Life Fieldhouse, its rabies status is unknown. So far there have been no reports of anyone having direct contact with the bat . 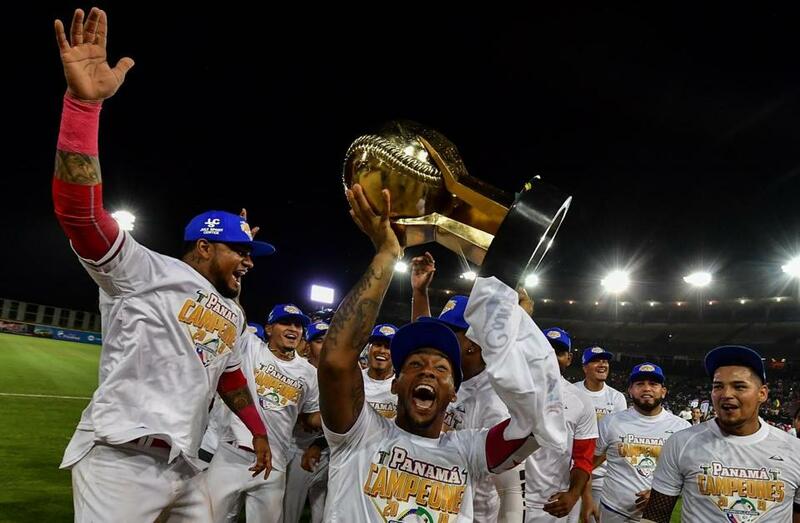 . . With a team that wasn’t even supposed to be in the tournament, Panama beat visiting Cuba, 3-1, to win its second Caribbean Series. The only Panamanian team to win the tournament was the Carta Vieja Yankees, who did it in 1950 with a roster full of American players. Panama was represented in the tournament for the first time since 1960 only after the Caribbean Professional Baseball Leagues moved the series out of Venezuela due to security concerns shortly before it began. With Panama hosting, the Toros de Herrera were invited to play as a guest. Players from Panama's Toros de Herrera celebrate with the trophy after their victory over Cuba in the Caribbean Series finale at Rod Carew Stadium in Panama City.